All pistons burn fuel to release energy in the form of heat and pressure. The pressure that is created by the air fuel ignition moves the piston back and forth in a cylinder which moves the connecting rod and causes the crankshaft to rotate. 4 stroke engines may use a carburetor, which mixes air and fuel at a proper ratio. The newer 4 strokes engines however use fuel injectors instead of carburetors. Usually every cylinder has its own fuel injector and are generally positioned near the intake valve. Intake Stroke: As the piston moves down the cylinder the intake valve opens drawing in a fresh charge of air and fuel. Once the piston has reached its lowest point the intake valve closes trapping the air fuel in the cylinder. 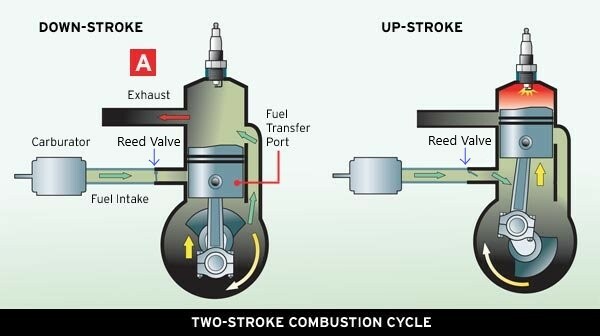 Compression Stroke : As the piston moves up the cylinder it compresses the air fuel mixture and a spark is generated. Power Stroke : Once generated, the spark ignites the air fuel mixture and creates tremendous pressure on the cylinder to drive the piston back down. That will be the force which turns the crankshaft and eventually drives the boat´s propellers. Unlike the 4 stroke engine Reed valves are utilized for this engine. These Reed valves have the ability to flex allowing the air fuel mixture in but not out. Each cylinder of a 2 stroke engine has its own separate crankcase where the crankshaft rotates. Each cylinder´s crankcase is sealed from the atmosphere as well as other cylinders and crankcases. Unlike the 4 stroke the 2 stroke once its pistons make their movement upward within the cylinder it creates a vacuum at the bottom of the crankcase which draws the air fuel mixture through the carburetor past the Reed valve and into the crankshaft. Once the piston makes its downward stroke it compresses that mixture inside that crankcase and so the pressure generated then closes the Reed valve. Then, once the piston is at the bottom of the cylinder it exposes the intake port of the cylinder wall. This is all done by a passage that connects the intake port to the crankcase which is called intake or transfer port. The pressure of the air fuel mixture in the crankcase forces the mixture into the cylinder. This performs the same task as the intake stroke on a 4 stroke engine. When the piston comes up again it seals off the ports and traps the airfluel into the cylinder. The piston compresses the mixture inside at the top of the cylinder. Then the spark plug ignites the mixture and increases pressure inside the cylinder forcing the piston inside the cylinder to move down which then ultimately provides the power to turn the crankshaft. As the piston approaches the bottom of the cylinder again the used air fuel needs to leave via an exhaust port. These ports are closer to the top of the cylinders than the intake ports so the piston exposes them first. This allows the exhaust gases to be released from the cylinder sooner. Now, when the piston exposes the intake ports, the pressure inside the crankcase forces the fresh charge into the cylinder. This charge helps force the remaining exhaust gasses out of the cylinder. Also, as the piston starts another upward stroke, it closes off the intake ports first, forcing more of the exhaust gasses out, before the piston closes the exhaust port. The beauty about the 2 stroke is that it does two jobs at once. While the piston is compressing the mixture inside the cylinder, it's also drawing a fresh charge of air and fuel into the crankcase. When the mixture in the cylinder is ignited this drives the piston back down and also compressing the mixture in the crankcase, getting ready to replace the spent exhaust gasses in the cylinder with a fresh charge. Scavenging is the process of pushing exhausted gas-charge out of the cylinder and drawing in a fresh draught of air or fuel/air mixture for the next cycle. This process is essential in having a smooth-running internal combustion engine. -The intake and exhaust ports are positioned on opposite sides of the cylinder. The top of the piston has a deflector dome that deflects the fresh charge up toward the top of the cylinder. This fresh charge chases the exhaust gasses across the piston and out the exhaust ports. The biggest difference between the two are that they direct the flow of the incoming charge differently. Cross-charged engines rely mostly on the shape of the piston´s deflector dome, while the loop-charged engine depend mostly on the shape of the intake passages. One more crucial difference between the four-stroke and two-stroke engines is lubrication. Most four-strokes use a pressurized oil system where the oil gets delivered all through the engine unlike the 2 stroke engine, where you can't use the crankcase for lubrication, since it's busy pumping air and fuel to the cylinders. So to be able to go around this predicament is to mix your fuel with your oil at the correct ratio. A four-stroke engine power cycle consists of four strokes of the piston in two revolutions of the crankshaft. • Intake stroke – as the piston moves down, the intake valve opens, drawing a fresh fuel/air charge into the cylinder. The intake valve closes when the piston reaches the bottom of the stroke. • Compression stroke – the piston moves up, compressing the fuel/air mixture. 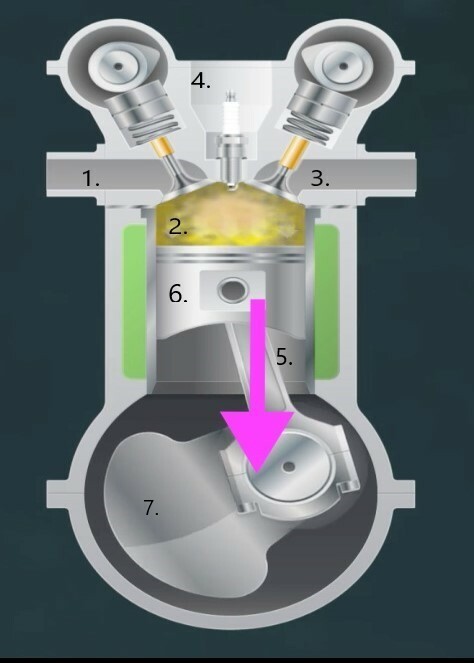 The mixture is ignited when the piston approaches the top of the cylinder. • Power stroke – the pressure from the expanding gases drives the piston down. exhaust valve opens and the piston moves upward, forcing the exhaust gas out of the cylinder. Most four-stroke engines use a pressurized oil system with a pump to distribute oil to internal components. • Draws a fresh fuel/air mixture through the reed valves into the crankcase. • Closes the intake and exhaust ports. • Compresses the trapped fuel/air mixture in the cylinder. • Closes the reed valves. • Compresses the fuel/air in the crankcase. • Exposes the exhaust port, allowing exhaust gas to escape the cylinder. • Exposes the intake ports, allowing the compressed fuel/air mixture to enter the cylinder. The two popular methods of scavenging two-stroke engines are the loop-scavenged (loop- charged) and the cross-flow (cross-charged) methods. • The loop-scavenged method relies on the shape of the intake passages and ports to direct the fuel/air mixture into the cylinder. • The cross-charged method relies on the shape of the piston dome to direct the fuel/air mixture into the cylinder. Late model Evinrude® outboards use direct injection. Many two-stroke engines require oil to be mixed with the fuel to lubricate internal components.